For other roadways name M41, see M41 (disambiguation). The M41, known informally and more commonly as the Pamir Highway (Russian: "Pamirsky Trakt", Памирский тракт) is a road traversing the Pamir Mountains through Afghanistan, Uzbekistan, Tajikistan, and Kyrgyzstan in Central Asia. It is the only continuous route through the difficult terrain of the mountains and serves as the main supply route to Tajikistan's Gorno-Badakhshan Autonomous Region. The route has been in use for millennia, as there are a limited number of viable routes through the high Pamir Mountains. The road formed one link of the ancient Silk Road trade route. M41 is the Soviet road number, but no road number is generally signposted along the road today, only destinations. Sources disagree on the termini of the highway, with Mazari Sharif, Afghanistan; Termiz, Uzbekistan; Dushanbe, Tajikistan; and Khorog, Tajikistan all being offered as the beginning of the highway. All sources, however, agree that the highway ends in Osh, Kyrgyzstan. Today, the route is part of the M41 highway, which starts at Termiz at 37°12′39″N 67°16′20″E﻿ / ﻿37.21083°N 67.27222°E﻿ / 37.21083; 67.27222 and ends at Kara-Balta to the west of Bishkek, Kyrgyzstan at 42°49′40″N 73°52′53″E﻿ / ﻿42.82778°N 73.88139°E﻿ / 42.82778; 73.88139. The route passes northward through Termiz before turning east and crossing into Tajikistan. It then follows a general eastward route through Dushanbe, the capital of Tajikistan, to Khorog, crossing the Kafirnigan, Vakhsh, and Bartang Rivers. From there, it continues east for about 310 kilometers to Murghab, where it crosses the Murghab River. The highway then passes through the 4,655-meter (15,270 ft) high Ak-Baital Pass and past Lake Karakul before crossing into Kyrgyzstan to its terminus in Osh. The road was constructed partly in the 19th century (during The Great Game), and partly in 1930s by the Soviet Union. In 2000s Pamir Highway was connected with China and Karakoram Highway. The Pamir Highway is designated as route M-41 over much of its length in Tajikistan and Kyrgyzstan, and is known as the second highest altitude international highway in the world (4,655 m). The section between Dushanbe and Murghab has the European route number E 008. The section between Sary-Tash and Osh, Kyrgyzstan has the European route number E 007. Construction and maintenance levels vary substantially along the highway. The roadway is unpaved in some areas, but otherwise paved most of the way. Except for its stretches in Kyrgyzstan and nearing Dushanbe, the road is heavily damaged in most of its length by erosion, earthquakes, landslides, and avalanches. 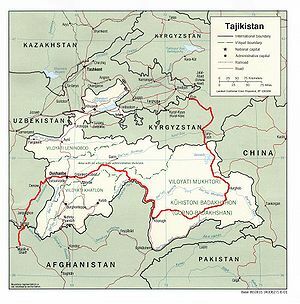 Sometimes referred to as the "Heroin Highway," much of the ninety tonnes of heroin that are trafficked through Tajikistan each year pass along this route. In the 1985 film Spies Like Us, the decoy GLG-20s played by Chevy Chase and Dan Aykroyd are told to meet their contacts on the "road to Dushanbe," a reference to the M41 highway. ^ Bing Maps (Map). Microsoft and Harris Corporation Earthstar Geographics LLC. ^ Salopek, Paul (August 15, 2017). "Sliding off the Roof of the World". National Geographic. We walk along the Pamir highway—Soviet-built in the 1930s, crumbling back into the elements, and the second highest road in the world after the Karakoram. ^ "Pamir Highway Travel Guide". Caravanistan. Wikimedia Commons has media related to Pamir Highway. This page was last edited on 20 March 2019, at 12:45 (UTC).